The following early history of the club was written by George Page Esq in the mid 1930s. 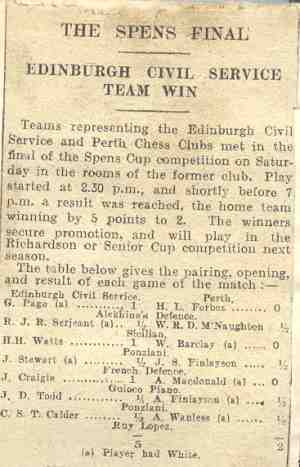 The Edinburgh Civil Service Chess Club began its activities in 1909. (b) to enter the Edinburgh Chess League. A club room, out with official premises, was obtained in the Gardeners Institute, Picardy Place, and here the club continued from 1909 to 1915, when, most of the members being with the fighting forces it was disbanded. The club was not immediately resuscitated at the close of the war, but in 1921 Messrs Rudd and Shepley, together with a few enthusiasts from the Board of Agriculture for Scotland decided to attempt to resume. The start was not propitious - only 6 players turned up at the opening meeting. At the next meeting, however, ample support was forthcoming, and in the following season 1921/2 the club had its greatest membership roll, viz. 40 players. The designation "players" instead of "members" is purposely used, since from its earliest days the membership has never included any sleeping members; keen play and enthusiasm has become a tradition of the club, despite many changes in personnel and numbers. The membership is now unfortunately down to 20, and of these 10 are not civil servants. By the new 1921 constitution the latter class of players was permitted to join the club to a limited extent. There has never been difficulty in obtaining the maximum support allowed from that source but the chess players in the Service, for various reasons, have not in recent years - provided the support which the clubs record would lead me to expect. Post-war transfers in the Service have caused a modicum of personnel changes in the club, but hardly account for the reduction in new members. Despite the fall in membership, the club since 1921 has always done well in match play. The Spens Cup (open to competition by all clubs throughout Scotland except the eight clubs that have qualified to complete for the Richardson Cup) was won in 1926 and the club obtained the right to enter the Richardson Cup competition. This, Scotland's premier club competition, they have not won, but have each year qualified by play to remain one of the select eight clubs who compete for it. 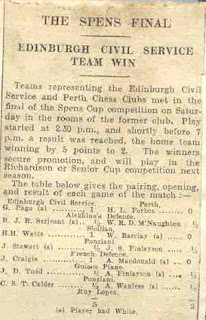 In the Edinburgh Chess League, the club, except for 1914-1921, has always had at least one team competing and in 1921-3 they had four teams, one in each A and B division, and 2 in C division. In 1909-10 at their first try they won C division, and again in 1911-12 and 1922-3, tying for 1st place in 1928-9. B division was won in 1911-12, 1923-4, 1931-2 and 1933-4; and A division (championship club of the League) in 1921-2 and 1933-4, while they tied for 1st place with Edinburgh Chess Club in 1924-5, 1925-6, 1926-7 and 1929-30. Since the club obtained the right of entry to the League's senior section, their team has never been lower than runner-up to the Edinburgh C.C., a fact which indicates the playing strength of the club, despite its relatively small membership. Two performances of the club in match play are well worthy of special mention. In 1922-3 a team of six young players, most of whom had been coached in the preceding season, entered and won (without playing a reserve) the C division of the league with the loss of only 2 games (1 by default! ), and in 1923-4 the same young team elected to play as a unit in B division. They won this too! Unfortunately, the public services scattered the personnel of this team before 1924-5 and therefore participation in A division was not possible. The other performance was even more remarkable and received wider publicity. This was the manner in which they won the Spens Cup in 1926; the team defeated Gourock 7-0, Alloa 7-0 and Perth 5-2 (4 games drawn) thus winning the cup without the loss of a game, a record since which has never been beaten or equalled. The champion of the club holds for one year the handsome shield presented by Sir R. B. Greig in 1929. The present champion is E. Schacke, and former holders are J. J. Carter, Inspectorate of Taxes 1928-9, and G. Page, Dept. of Agriculture 1929-33.